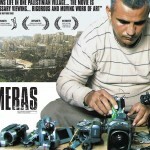 Screening as part of Bristol Palestine Film Festival, 2012 – Five Broken Cameras, opens on the 7th December and will run until the 13th December. There will be both a Cinébabies screening and a Cinébites deal. Cinema goers will need to plan their schedules carefully. On Saturday 8th December we will also be hosting ‘Writing a Path Through Palestine’. This inspirational event will look at what drives writers to explore the country in their work and what stays with them long after they have finished? Hosted by Bidisha, also joining will be Selma Dabbagh and Guy Mannes-Abbott, writers who have each written highly acclaimed books set in Palestine. On the 13th December will be one of the most popular events this season, described by Coexist as an eclectic evening of the latest short films on Palestine, this event is presented in partnership with Easton Energy Group on a cycle powered cinema. Not to be missed, advanced tickets can be purchased from Bristol Ticket Shop, follow this link for more information.